over the falls in a boat or raft. 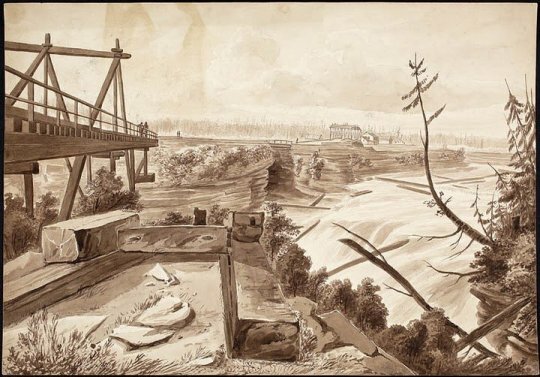 at that time was that of Philemon Wright on the Hull side of the Grand (Ottawa) River. sort of thing was routine. exposure/hunger in full view of the townspeople. See the print, below, by W.H. Bartlett. 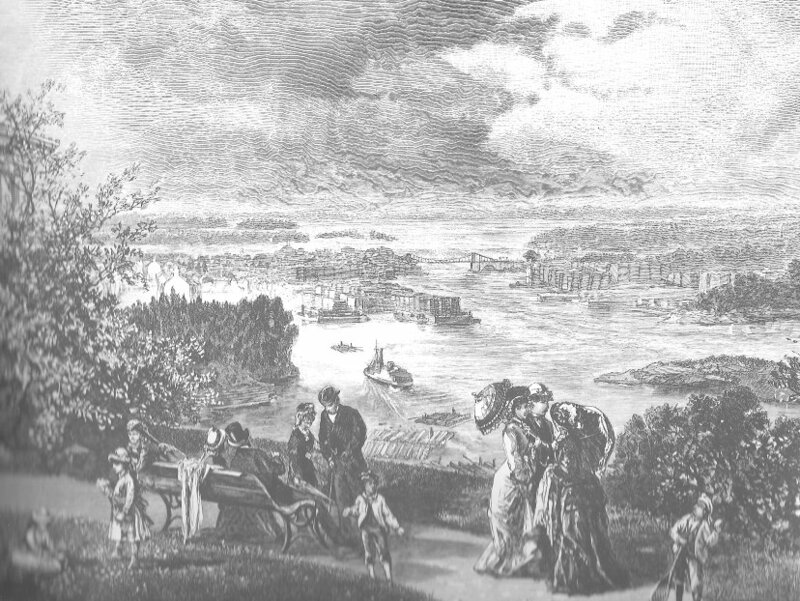 Photo Source: Ottawa Waterway, Gateway to a Continent, by Robert Leggett, page 56.
because the Moore family was so prominent. 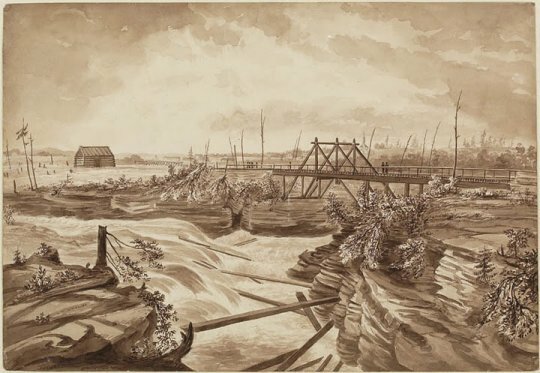 mills and power development at the Falls and industrial development at Lebreton Flats. 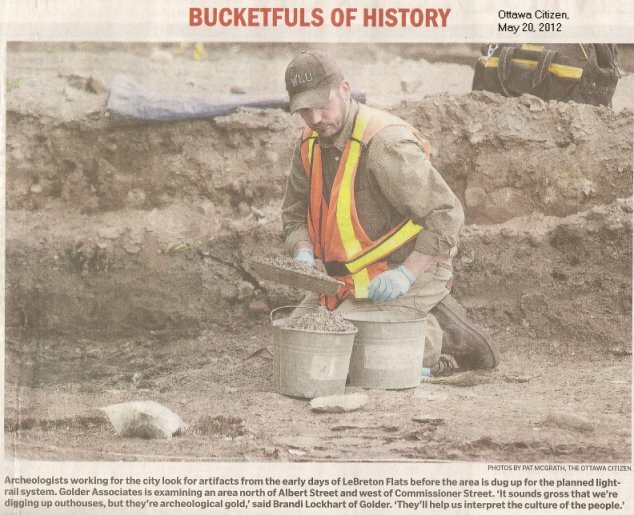 See also Philomen Wright settlers in 1800.
and Michael Davidson's pages regarding the history and architecture of the Chaudiere. or not. The record of the death is in Pinhey's diaries. Please note that Hugh Conley's (various spellings) death record is in Pinhey's journals. The date of death is 26 January 1830. I have copies of documentation in this regard. Church. Do you know where I could locate the records. Catherine Lewis and had a connected family. Hope this helps others. I understand but do not have proof some took the Conley name. 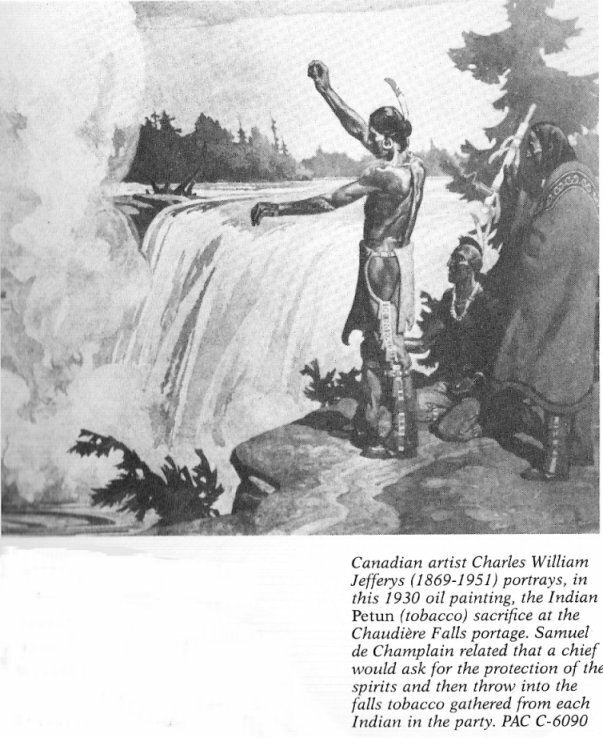 died in a canoeing accident at Chaudiere Falls on June 1, 1836. George and Jennet who secured the original land grant. I got James Hawley's death date from his headstone. Buckham, in particular, was very involved in the community. Source: Notre Dame Cathedral records (Thanks to Ellen Paul). Adam Romaine. There is also mention of a James McConnell who survived. For those of you who are interested I found this on page XXXIV. of the Lebreton Flats and Chaudiere Falls area. Duke Street was familiar to me in the 1950's. We used to travel by car to pick up ice for our ice-box. 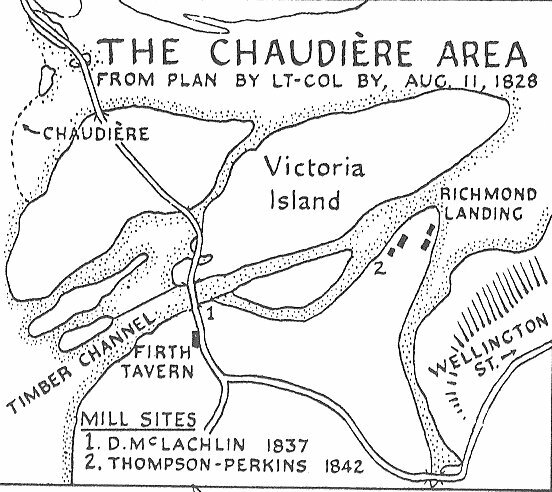 of the Lebreton / Chaudiere districts, pre-1901. There are about 40 photos and a couple of maps. I might be adding more material later. 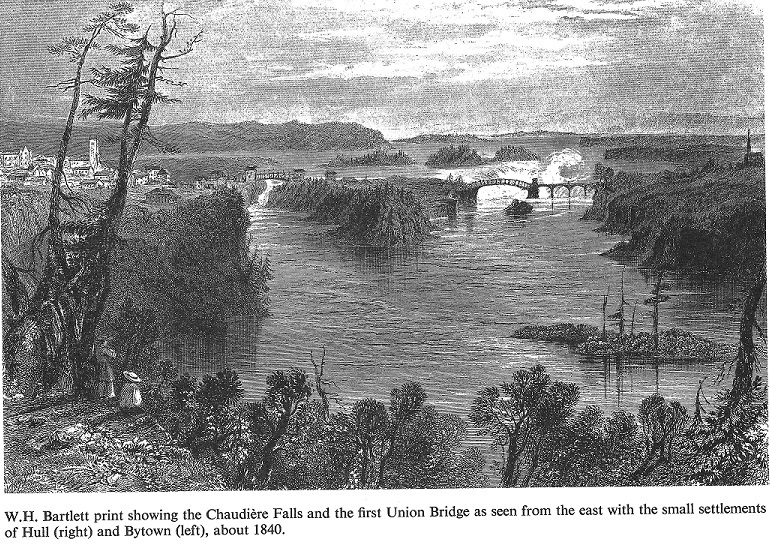 United States market), can be seen on the islands at Chaudiere Falls and across the River in Hull, Quebec. Ella Bessey was a daughter of E.B. Eddy (see Chugg family history on the Aylmer Road). of the 1923 original, 1" = 1mi. Stittsville, I'd be glad to scan any sections you might want. original survey 1923. Revised 1935. Published by the Geographical Section, General Staff, Department of National Defense. Reprinted 1940. 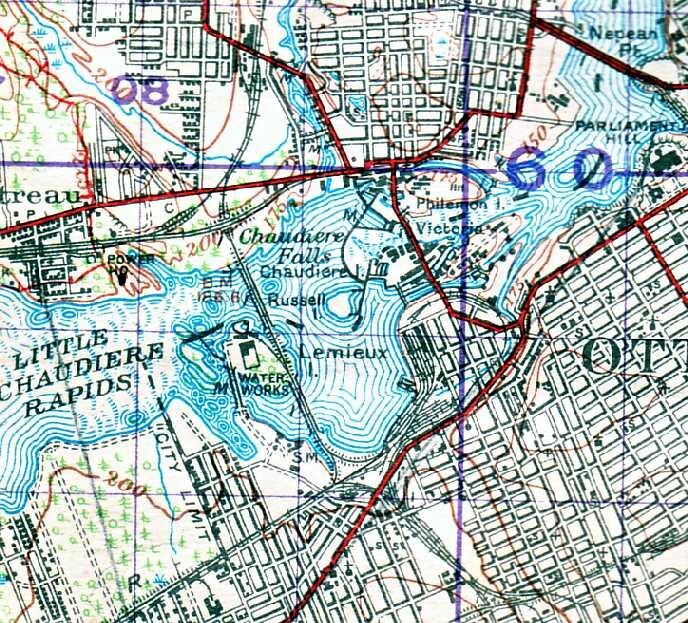 This extract from the map shows the Lebreton Flats neighbourhood - before it was razed. pick up a couple of blocks of ice, covered in sawdust, on Duke Street. The railway yards are also shown on the map. 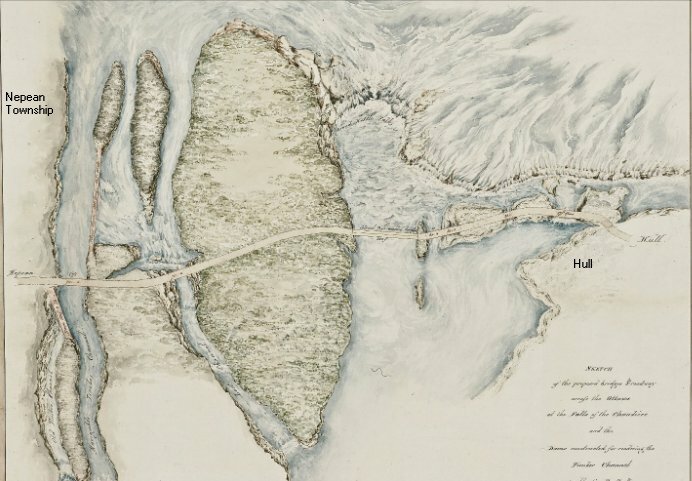 The portage route used by the voyageurs was located on the north side of the Ottawa River at Hull, Quebec. 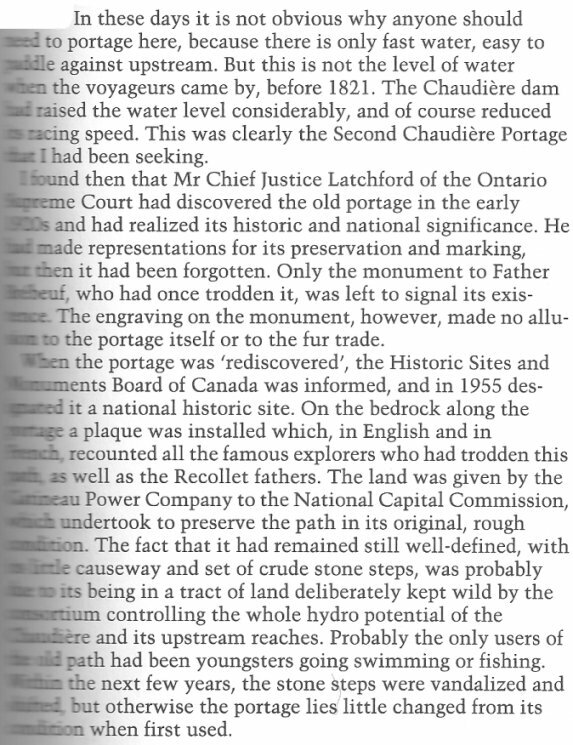 In the 1920's, Chief Justice Latchford, rediscovered the portage. Here are two pictures from the James Pattison Cockburn Gallery. They are dated 1825 (left) and 1826 (right). Hello Friends. Could this question please be added to the "Bytown or Bust" web site ? been closed for refurbishment in recent years. was the location which later became Perkins village (now in Val des Monts Municipality). These two locations are not much more than 20 miles apart. Can anyone please tell me whether or not these two 'John PERKINS' were the same person ? How are you? I am busy writing the story of Thomas Hunton and Family. I will give you a copy once I have completed it. by Gertrude Van Cortlandt, 1858.
when he let himself off. He was immediately pulled in along the main rope, not, however, without touching the water several times. for their kindness. He then walked away, seeming not the least injured." There are more stories similar to this one also appear in her writings. want to know if he is one and the same person. possibly settling first in Glengarry County. millstone used in the Learmonth mill and a photo of the old mill itself. George Learmonth and his wife. I did not see a place to register at their website, but if you scroll down you will see a spot where you can leave your name and email address for updates. I`m sure if you show up they will let you in anyway. As you know, Windmill Development Group has put in a conditional offer to purchase this historical site. anyways. I thought Domtar had leased the lands (islands)from the government. So now I wonder, who sold to Domtar? of the Parliament Buildings prior to Confederation. Let's hope the cities of Ottawa and Gatineau get this right! I thought you would enjoy this map drawn by Lieutenant W. Pooley. His name is at the lower right hand side. 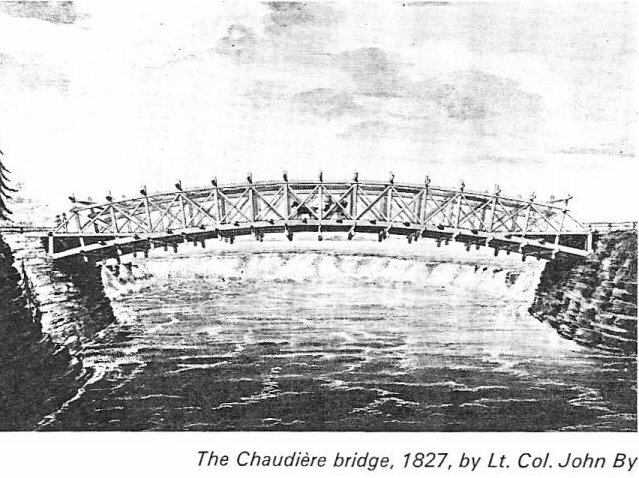 Shows proposed bridges and timber-slide. good collection of photographs and paintings of work done by Ralph Burton.